When I was starting out in photography, there were honestly a ton of resources out there that I took advantage of, and so much of what I have learned has been what I've spent hours upon hours learning from YouTube, information shared by some of my favorite photographers and a ton of trial and error on my own part. What works for me might not work for you and the trial and error process is how you find that out! Having great gear can mean incredible things for your work, but I'll tell you that just honing in on my craft is what helped me to realize that learned skill, practice and a true understanding of light can take you much further than having the best gear. I'm also not a techie by any means and have no interest in having the "best" or "latest" equipment. I aim to have equipment that will help me deliver the very best images I possibly can to every single client...sometimes that's a spiffy new lighting kit and sometimes it's a lightly used lens that some might consider out of date! 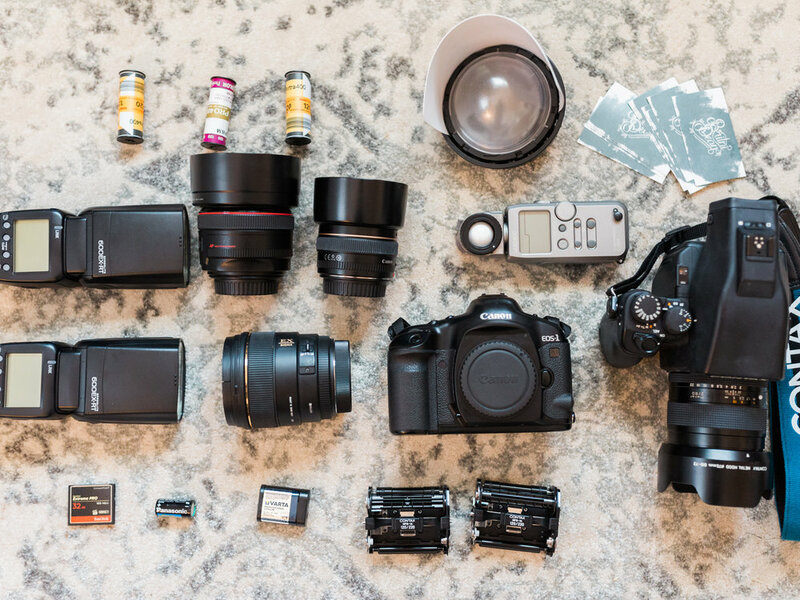 All that being said, I have had more and more photographers who are asking questions about my gear - some are curious about shooting film and some who are starting out just want to know exactly what I have in my bag! *Not literally in one bag, because GOOD GRIEF this stuff could never possibly fit in one bag! I'm of course more than happy to share and will try to give a little bit of insight along with the list of equipment I own! Just keep in mind that so much of the final product comes from what you know about light, whatever gear you have to work with and who you are as a photographer. These are the three main camera bodies I shoot with. I am what is called a hybrid photographer - meaning I shoot with both film and digital. My Contax 645 is what I use 100% for portrait sessions! This is a medium format film camera that I accidentally fell in love with...something about the camera combined with the Zeiss glass has had me all googly-eyed from day one. I use this camera body for a ton of my work, when light and time permits. I would say at this point in my business, I am shooting 40% film and 60% digital on wedding days, though every wedding will vary. For that reason I just welcomed the Canon 1V into the family! When I need a wider angle or am just shooting details, I'll often reach for my 1V because it allows me to use all of my Canon + Sigma lenses and also allows for more frames per roll of film! As for digital, I have been using my Canon 5D Mark III for a few years now and it's never let me down...my favorite thing about it is the dual card slots which is a MUST for weddings! I have all images record to both cards for extra peace of mind. I also just love this camera for its full frame sensor + low-light capabilities which is another must for weddings. I have often debated about adding in the Canon EF 70-200mm f/2.8L IS II USM Lens to my lineup, but not every wedding seems to need it and I just can't justify the cost yet. When I know a wedding will not allow for me to use my prime lenses standalone, I'll just rent this bad boy! That being said, primes are my jam. My Canon 50 1.2 seems to stay on my digital camera most of the wedding day, though it's not always my favorite for moving subjects during a ceremony. This lens is amazing, but takes some serious practice and is the main reason I shifted to back-button focusing. My Sigma 35mm is my favorite lens for those getting ready shots along with family formal shots larger than 6 or so people. I use my Canon 50 1.4 on my Canon 1V and it works perfectly for detail shots! My Sigma 85 1.4 lens was kind of my first "big girl" lens and I don't use it as often as I used to, but every now and then it makes its appearance and sweeps me off my feet again. The Hoya filter set is one of my favorite things on the planet because it cuts the need for a macro lens and I can use the filters on both my film and digital lenses! WIN! Such a great and reasonable investment if you're looking to get sweet detail shots or for macro work. Light Stand (honest to goodness, no memory of where I bought this but the brand is Impact). I am contantly doing what I can to up my lighting game because you don't always know what you'll be walking into on a wedding day! Plans change and as a wedding photographer, you just have to be ready for whatever is thrown your way and be able to deliver amazing images. The last two years, I've really dived into OCF (off camera flash) and it has been a game-changer! I'm currently looking into adding the MadMod diffusers into my setup for this year to see if they fit my style! For the most part, the Spinlight 360 has served me well, but I feel like it's time for a change! I only use Duracell Coppertop batteries in my speedlites and lighting equipment because I've found they last the longest and have the quickest recycle time. Sheesh, a girl could spend a fortune on film accessories. Seriously though. If you like to spend a lot of money, get into film. LOL! 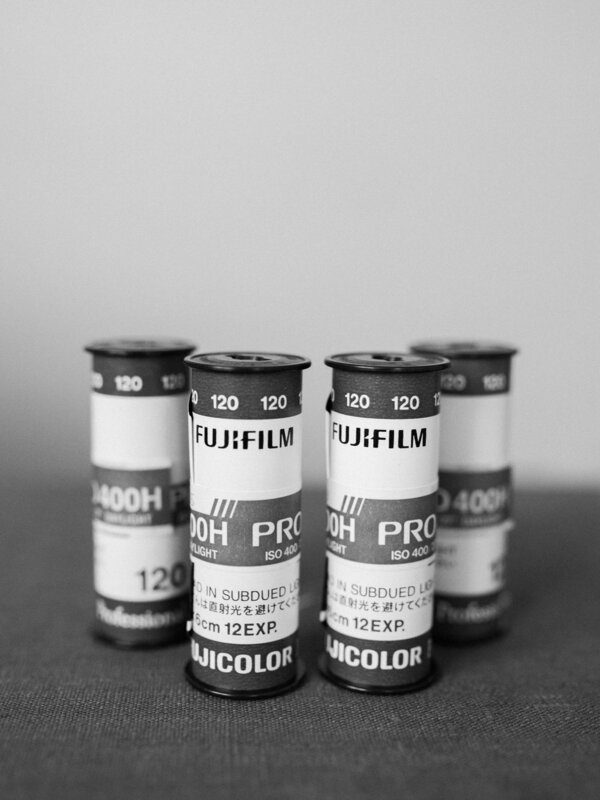 I currently have three film inserts for my Contax 645 which allows me to load film more quickly on a wedding day! I only use Varta batteries in my Contax and have never had any issues at all. The CR123A 3V batteries are what my Sekonic light meter uses and I've literally never changed the battery in the two years I've owned the meter. Whoa. As for film stocks, Fuji 400h is what's in my camera 98% of the time but I've been having fun experimenting with pushing the Portra stocks and pulling out some black and white at wedding receptions. A lot of people get excited at the idea that I shoot film, but I get a lot of people that are confused as to why I would back-track from digital. It's simple really - I took my first black and white film class back in college and it changed not just how I saw through the lens, but how I saw the world with my own eyes. When I wasn't sure who I was as an artist, I looked to the film medium and I remembered. It also takes away a ton of time spent editing behind the computer, plus the skin tones for me are just hard to beat. I don't know if film will be a part of my professional style forever, but I know it will forever be a part of my life. I just purchased the Lowepro rolling bag and I've been kicking myself for not getting one of these beautiful things MUCH sooner. It is incredible to be able to just load up all (or most of) your gear in one place and be able to literally ROLL into the wedding day without killing your back first thing. It fits basically all of the gear you see above. I have been using SanDisk Extreme Pro CompactFlash cards since my second wedding back in 2012 and have never had a problem with corrupt or faulty cards. Let's hope that never changes! I currently back up to two external hard drives along with an online backup (BackBlaze) because as a professional, it's just part of what we do for ourselves and for our clients. Please, please - DON'T shoot weddings and not have a plan and proper equipment to back up those precious memories. As for the Oatmeal & Lace apron - this little nifty accessory is one I won't be caught without on a wedding day! It has got three pockets that allow me to store unexposed film, pens, stickers for labeling film, timelines for the wedding day and a pocket for exposed film. Sure, I might look like a grandma with it on (thanks, Mandy) but it is so useful and a must for me. You can even have your logo put on the apron...so cute! Add this dandy apron to a dress with pockets and I'm a happy camper. For anyone looking to take the leap into photography, my biggest advice on gear would be not to focus so much on the most expensive camera body. Sure, I love my 5D Mark III for it's full frame sensor and low light capabilities - but what can have the biggest impact on your photos is the lens you choose! Glass is *almost* everything, and you can get an incredible lens for just a few hundred dollars (hello, Canon 50mm 1.4)! Don't be afraid to try and find the equipment that works best for you and fits your own personal style! For me personally, getting back into film is what has really pushed my style to evolve into what feels perfectly right for me and my business and it took a long time to figure it out! Trial and error is just a part of the fun - when I look back at my earlier work, I nearly cry at the immense changes...I mean, I used to add rainbows to 99% of my photos in Photoshop. YES WAY. Change is so good, friends. Hopefully this has provided some helpful insight for at least one person out there...if you have questions, please comment below or feel free to email me at hello@britnidean.com.